The Year before that she was a t the Bumper Shot with De La Soul, Macy Gray, Common, and the Black Eyed Peas in Seattle, Washington. Selling out at every venue and killing the mic on every stage, holding it down independent-indie style hasn’t been hard when you’re doing it for the love of music, the reason and unity. “If you haven’t heard her LIVE band Feline Science then you haven’t heard the half of it. “ Medusa and Feline Science (consisting of a DJ, drummer, bassist, keyboard, percussionist, guitar and background singers) rocks the stage like Sly & the Family Stone taking the rap community by storm! If Aretha Franklin is the “Queen of Soul”, then Medusa is Definitely the High Priestess of Hip-Hop, having won the Rap Sheet Emcee World Championship hands down! 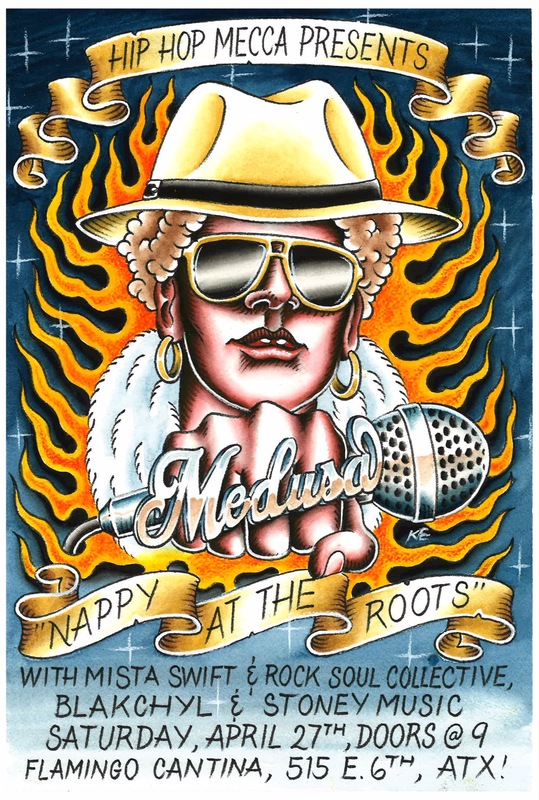 “MEDUSA’s skills are not limited to music.” “She has played her behind the scene talent in film scoring, soundtrack production and acting.” Such credits include “Life Is A Traffic Jam,” featuring the late Tupac Shakur, in Vondi Curtis’s film “Gridlock” and in the sitcom “Moesha” where MEDUSA made an impact on the world as Lady Lunatic.